This is so cute! I am trying to make a halloween card right now, but not feeling highly motivated. But... visiting your blog helps. Bloglines isn't reading your current posts, though, and I don't know why. I've got four or five blogs it's not getting the feed for. Cute little image and a lovely Autumnal card. Very cute stamp! It is a great sketch by Jo isn't it. You've done a great job with it. Thank you for joining us at Sketch Saturday this week! 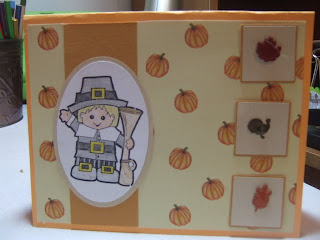 fab card, love the autumn colours and cute image - great work. Don't know why I had such trouble with this week's sketch- everyone else seems to have done so well!!!! This card is gorgoeus Chrissy, the pilgrim man is so cute.